Once Upon a Time in Hollywood trailer: Director Quentin Tarantino brings Leonardo DiCaprio, Brad Pitt together for the first time in a sprawling return to his Pulp Fiction roots. Watch here. The first look at Quentin Tarantino‘s next film has finally arrived! After revealing the first poster for Once Upon a Time in Hollywood on Monday morning, Sony Pictures released the debut trailer for the upcoming Tarantino vehicle, which arrives in theaters this summer. The footage in the trailer marks the first time fans have seen anything from Tarantino since The Hateful Eight was released into theaters back in 2015. The release of this film has certainly been a date that fans of Tarantino’s have had marked on their calendar’s for quite a while, and this trailer means we are just one step closer to opening night. Also Read: Trailer Teaser of ‘Stranger Things’ Season 3 released. The first trailer for ‘the 9th film from Quentin Tarantino’, Once Upon a Time in Hollywood, was released online on Wednesday by actor Leonardo DiCaprio. This is DiCaprio’s first film since his long-awaited Oscar win for The Revenant in 2015, and his second collaboration with Tarantino, who last directed him in Django Unchained. Once Upon a Time in Hollywood also stars Brad Pitt, Margot Robbie and dozens of popular actors in supporting roles, as Tarantino returns to his Pulp Fiction origins with a sprawling story set in 1960s Hollywood. The film will touch upon the infamous Manson murders, in which members of Charles Manson’s cult killed several people, including Tate, a popular actor who was also pregnant at the time. Glimpses of Manson and his infamous ranch are also seen, alongside glitzy shots of Hollywood, which Tarantino reportedly shot by painstakingly dressing real Los Angeles streets. Once Upon a Time in Hollywood centers around the horrifying Manson Family Murders that took place in Los Angeles in 1969. Judging by the mixture of both real-life and fictional characters in the movie, it’s likely that Tarantino will take creative liberties with the actual events that took place, much like he did in Inglorious Basterds in 2009. That film featured an alternate version of history in which a group of American soldiers succeeded in killing Hitler. Tarantino has rounded up his most impressive on-screen ensemble to-date with Once Upon a Time, reuniting with Django Unchained star Leonardo DiCaprio, as well as Inglorious Basterds‘ Brad Pitt. This will mark the second time Tarantino has worked with each of the two A-listers, though they have never been in a film together. Suicide Squad‘s Margot Robbie plays Sharon Tate in the film, the actress who was one of the real victims of the Manson Family. 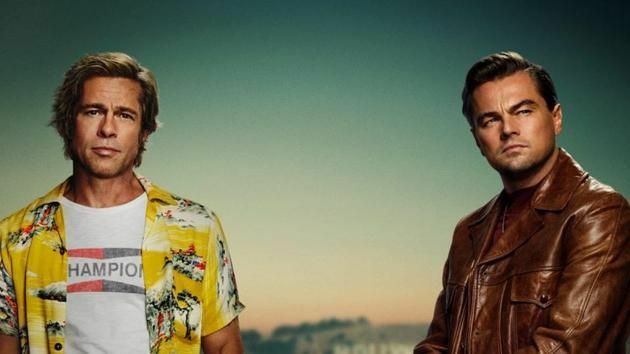 Once Upon a Time in Hollywood also casts Al Pacino, Emile Hirsch, Bruce Dern, Damian Lewis (as Steve McQueen), Tim Roth, Michael Madsen, Kurt Russell, Timothy Olyphant, James Marsden, James Remar, Dakota Fanning, Scoot McNairy, the late Luke Perry, Lena Dunham, Clifton Collins Jr, Mike Moh (as Bruce Lee), Margaret Qualley, Rumer Willis, and Damon Herriman (as Charles Mason). Once Upon a Time in Hollywood is set for a July release.